Stretch vehicles with English speaking safari drivers who are experienced game finders will be supplied for the party. Each vehicle will have a shooting row dedicated to each photographer. A non-photographer can sit in the front seat next to the driver where it is possible to stand on the seat for a view through a hatch in the roof. Each safari vehicle is equipped with a power inverter and multiple outlets for charging camera batteries and laptops. All food and soft drinks/water while on a safari drive is included. The price does not include alcohol, tips for driver/guides and camp staff, soft drinks and water in the lodges, baggage handling, international flights and departure taxes. 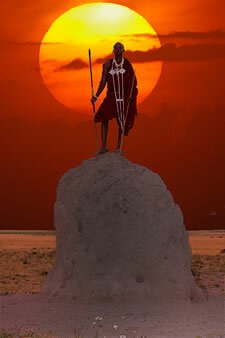 Maasai village visits are not included, but can be arranged at a slight additional cost. Make sure you understand tipping guidelines for your tour. Please contact us for details. The schedules shown below might change slightly to accommodate each party's specific interests. Included in the luxury tour (in addition to the general inclusions, above): all accommodations and meals, all park fees, all activities listed above and temporary membership in the flying doctors service. We supply unlimited soft drinks and laundry while in the luxury mobile tented camp in the Serengeti at Naabi Hill. Day 1 - Arrive in Arusha, Tanzania (Kilimanjaro Airport KJO), overnight at Impala Hotel. Day 2 - (2.5 hour drive) go to Tarangire for two days. Game drives morning and afternoon. (Budget Tours start on Sunday). A separate vehicle will carry the camp staff, tents and equipment. The three person camp staff sets up and takes down tents, does laundry during the day (tips expected) and does all the cooking, food preparation and dish washing. SAS Safaris will provide tents, sleeping bags, mattresses, towels, all park entrance fees and flying doctors service. Clean showers and flush toilets are present at each campground, in addition to a beverage kiosk. This tour visits the same areas as the Luxury tour, ensuring the same game viewing opportunities. Copyright© - All Rights Reserved. Images Copyright© Charles G. Summers Jr. and Rita Summers. Deo Sawaki Mmbando, a native Tanzanian, was educated as an accountant and worked in the banking industry for 6 years. After 10 years experience as a driver guide and 8 years experience as a head driver, both with a large safari company, Deo decided to leverage his love of business and African wildlife by founding a charter safari company, Sawaki and Summer Safaris. Deo's prior guide-driving experience gave him intimate knowledge of Arusha, Tarangire, Lake Manyara, The Serengeti, Ngorongoro Conservation Area including the Crater and Ndutu, Selous Reserve, Ruaha, and Mikumi National Park. He has guided world-class wildlife photographers and ornithologists through his beloved countryside.